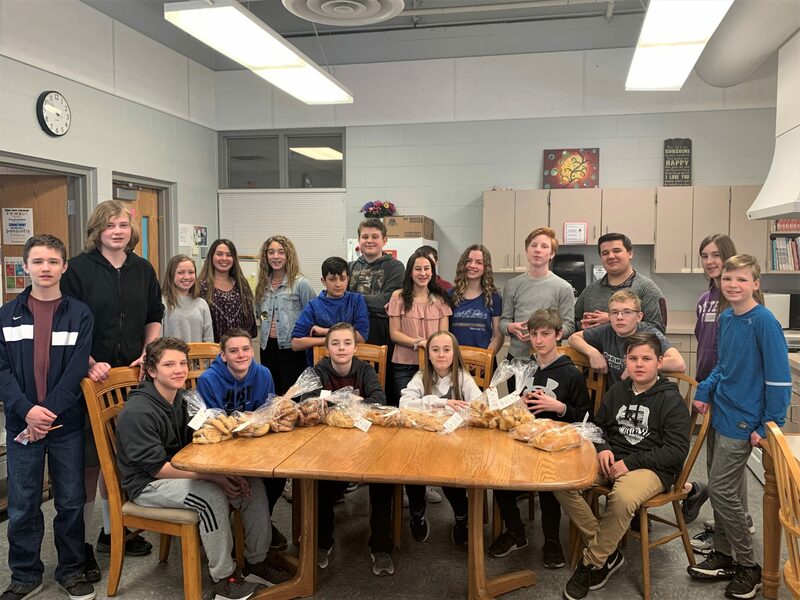 This past February, Hudson Middle School students in Deb Gangnon’s 8th grade Food Science/Snack Shop classes baked and donated bread to HOME (Hudson Outreach Meal for Everyone) Program. Students also served a meal at Bethel Lutheran Church. Brian Ullom, one of the coordinators of the meals at Bethel Lutheran Church said guests were very appreciative and the student baked breads were a hit. As part of this class, students learn the science behind baking bread. Once they learn the basics of bread baking, they explore recipe writing and the science involved to create their own original versions of whole wheat bread. Along the way, students learn how ingredients interact with each other, about food photography, and nutrition analysis. This project was sponsored in part by the King Arthur Flour Company, not only to encourage students to learn how to bake and the science behind it, but also give students the opportunity to serve their community. As part of the program called “Bake for Good”, King Arthur Flour Company donates the flour and yeast used for the donations.